School of Fish: A very Good Friday! Light of the World, our local village church, decided to take opportunity of Good Friday for outreach. Many people are off work and home from school, so it was a good chance to meet people at home and talk with them about the meaning of the day. Ugandans are so friendly and usually welcome visitors. The families my group visited all thanked us for coming, thanked us for sitting with them, and thanked us for reading the Bible with them. Another group returned with Jack fruit, sugar cane and eggs which were all gifts from the homes they visited. Only one group was sent away by neighbors of another religion. Here is the photo of my group. We were scheduled to meet at the church around 9am. Since we are trying to finish our school year before we leave on furlough, we still had classes in the morning. Around 11am, I walked to the church hoping that I hadn't missed the opportunity. But we were operating on Ugandan time. 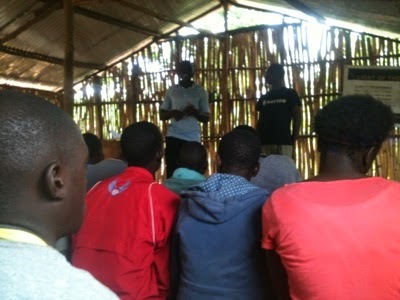 Around 11:30 we began a time of worship, prayer and instruction about how to share the gospel. We were also instructed about the importance of greeting people. Greeting people is so important here. People do not start talking about anything until they have asked about one another's day and their families. It was a good reminder of cultural differences. After our intructions we divided into our groups. Around 12 noon we left with instructions to return by 3pm to report and encourage one another. As we recieved this instruction, it occurred to me that lunch was not a part of the schedule. I realized that was another cultural difference. As we walked around Buundo village, we talked with people about Jesus and invited them to worship with us on Easter Sunday. I enjoyed the opportunity to share the good news about Jesus with native Luganda speakers. I often try to share Jesus with my friends in the village, but my Luganda is not good enough yet to answer questions about God. While we visited, I was able to help some women who were cooking, to pray with several who were sick, and to just sit and visit with people to live out the love of Jesus. I was also glad that some of the teenagers from GSF were able to be a part of this opportunity. Please pray that many who heard the gospel, will come to church to hear it again. Also please pray that those who prayed to recieve Jesus, will grow in Him. I am so thankful to be able to celebrate Easter tomorrow with those who have now been raised with Christ, having eternal life in Him!